Bystanders look on as flames and smoke billow from the roof at Notre Dame Cathedral in Paris. As fire swept through Notre Dame Cathedral on Monday, New Englanders in Paris were stunned by the devastation. Several of them described their experiences to the Globe. 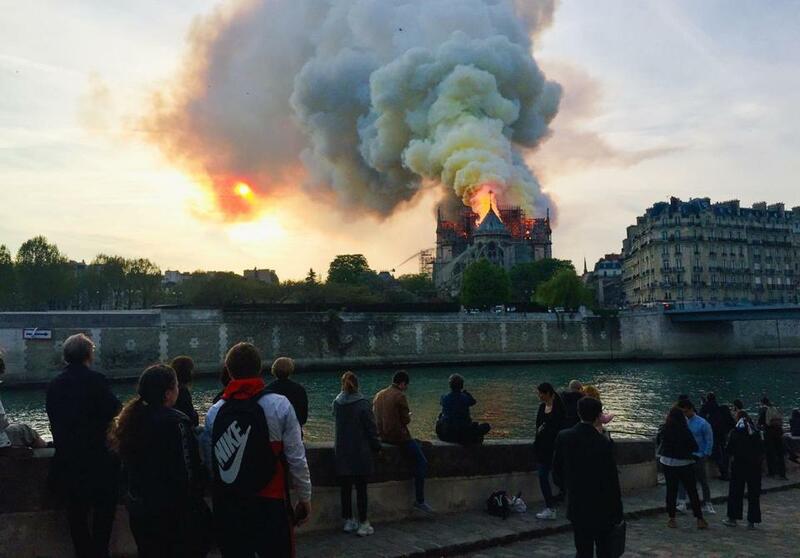 Carolyn Margulies, a Tufts University graduate who lives in Le Mans, France, was visiting Paris with a friend when they saw smoke coming from the direction of the iconic church. As they drew closer, they saw flames of green and orange shooting from the back section of Notre Dame. “You could feel the ash hitting your face,” said Margulies, 22. She and her friend stood watching the flames engulf the structure for about two hours. Around them the city was quiet except for the sound of street performers. Margulies said she can’t help but think about how much history the 12th-century cathedral has seen. “Knowing how much the world has changed around the church, and how it’s not going to be there anymore, it’s scary,” she said. Sadie Nacar , a 17-year-old student at East Bridgewater Junior/Senior High School, visited the landmark with other students from her school just hours before the fire. For many of them, it was the first time seeing a building so awe-inspiring, she said. “We were all just blown away by it,” she said. She and the other students were returning to their hotel from dinner when they heard the news. Nacar said some of her friends plan to visit the cathedral again to “to pay respect to what remains,” she said. Nick Meserve , 21, of Contoocook, N.H. was in the Centre Pompidou museum when he received a notification about the fire on his phone. People in the gallery gathered around the window to watch the flames. When the spire fell, everyone gasped, he said. Meserve saw people crying everywhere he went. When people saw the flames after leaving the subway, many recoiled and covered their mouths. Eventually, he returned to his host family’s apartment. “They were a little traumatized by all the sirens outside because it reminded them of all the Paris terrorist attacks,” he wrote. Many people are in shock, Meserve said. “Notre Dame has been an emblem of France for so long, that losing it so quickly and abruptly is just so devastating — and the week of Easter too,” he said. Shantel Bartolome , a 20-year-old Tufts student studying in Paris, watched the fire on television, afraid to venture outside. Veneration of the Crown of Thorns, a ceremony held on the first Friday of each month. The Crown, originally from Jerusalem, is believed to be the crown worn by Jesus Christ and is one of the city’s most precious relics. Bartolome said she will remember that visit for the rest of her life. She fears the veneration she attended will be the last for some time. “I’m really grateful for that, and I honestly just keep thinking about and return to how special the Notre Dame is to so many people in creating those kinds of spiritual moments,” she said. The fire comes during a divisive time in France, as protests have disrupted city life for months, Margulies said. Still, she believes this moment can be a time of togetherness.